A 25.91 metre new-build expedition motor yacht has been listed for sale by John DeCaro at All Ocean Yachts. 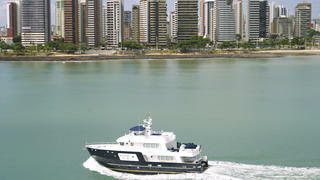 To be built in steel and aluminium by Brazilian yard Inace, she is scheduled for delivery in 2018 as one of the yard’s Fortaleza 85 series. The design offers two layout choices of four or five cabins, with an on deck master suite standard on both layouts. In one of the layouts, the four cabin arrangement, the port side queen bed guest cabin below deck is configured as a crew lounge with laundry and additional freezer and storage. The five cabin layout has four double queen cabins below, accommodating 10 guests. A voluminous sky lounge is offered that can easily seat 10 guests and has a wet bar and office space, and there is a huge modern fly bridge with a full bar that seats eight guests, dining for 10, plus lounge seating, sun pads and a Jacuzzi spa tub. The aft deck of this yacht for sale is large and has a dining table seating 10 guests, a drinks fridge to port and a sink with storage underneath to starboard. There is a full size door with comfortable stairs down to the engine room in the port side bulkhead. The exterior finish will have a white hull and superstructure paint job. Teak decks will be on the flybridge, swim platform, aft deck seating area and main deck, side decks and all steps. Twin 469hp Caterpillar diesel engines will give her an enormous range of 4,000 nautical miles at a cruising speed of 10 knots. The new build Fortaleza 85 is asking $6,895,000.